Autres informations Description: Barko's hard-working trailer/truck mount loaders offer optimal fuel efficiency and transportation flexibility for a wide range of logging and saw mill operations. The loaders incorporate the highest quality engineering and components to withstand the demanding needs of forestry professionals and deliver more loads every day. The 295B is powered by a 173-HP Cummins QSB6.7 Tier 4 diesel engine with SCR after treatment. The 295B features a pilot-operated control system, in conjunction with IQAN electronic controls, to provide a more natural feel for the operator. The system can be configured as necessary, and maintenance can be performed simply without a specialist. 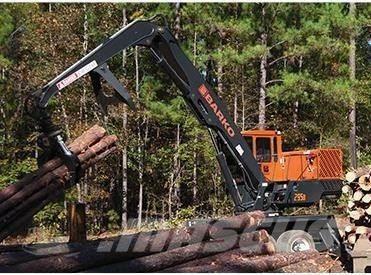 Unlike open loop systems that waste fuel, Barko's efficient load sensing system delivers power only when needed. Load sensing valves and pump deliver excellent metering by matching pressure and flow. Adaptable to most attachments, the system runs cool. Efficient and precise grapple functions reduce operator fatigue. Multi-functional dual joystick controls are ergonomically designed to provide enhanced comfort and productivity. Dual motors and planetary gearboxes produce 30,000 foot-pounds of swing torque, while improving machine balance. Standard 1,300-pound cast steel counterweight provides extra stability. Vibration-isolated "floating cab" provides a smoother ride. Weather sealed, insulated and climate controlled, the cab includes a suspension seat with armrests, foot swing controls and halogen lights. Digital display provides enhanced monitoring of all machine functions. 120-gallon (454 L) fuel tank capacity allows for longer operating intervals. Two sets of foldaway stabilizers further contribute to keeping loads steady. Sur Mascus France, vous pouvez trouver un/une autre Barko 295B. Le prix de ce/cette Barko 295B est de - et il a été fabriqué en 2018. Cette machine est visible sur Hickory, Mississippi en/au États-Unis. Sur Mascus France, retrouvez des Barko 295B et bien plus de modèles de autre.